One of the most anticipated flooring shows has started off the new year strong! The International Surface Event held in Las Vegas, Nevada every year was once again, nothing but successful for CFI. This year, CFI was able to assist in repeating history by helping manage the first TISE Installation Competition since 2003! Due to the lack of installers and quality installations being the #1 topic within the industry for the last several years, Informa and CFI found that bringing the Installation Competition back to TISE show floor would be beneficial to not only motivate young installers but spotlight those installers for companies and organizations to notice! This year, the flooring categories in the competition included: Carpet, Ceramic Tile and Hardwood. Out of about 50 total installers who submitted jobs months prior to the show in hopes of being chosen to compete in Las Vegas, only a lucky nine were selected to show off their talents on the show floor. Carpet competitors included: Chris Sessum of ECS Floor Covering out of Mill Creek, Washington, Donald Perkins of DFP, LLC out of Torrington, Connecticut and Scott Zito of S. Zito Floor Covering, LLC out of Kansas City, Missouri. All three competitors were handed the same work order and products and they all three amazed judges with not only their amazing hand skills but as well as their dedicated attitudes they held through the whole competition. “It was exciting to see the enthusiasm of the participants, as well as the hundreds of people who came to watch them display their skills. This event is so important for others to view, as the products are not complete without a professional installation. The contestants made us all proud by the quality of their work. The various methods to achieve the desired results was interesting to watch. The donation of tools, supplies and product by the manufacturers and distributors was overwhelming and greatly appreciated” says Jim Walker of American Floor Covering Institute. 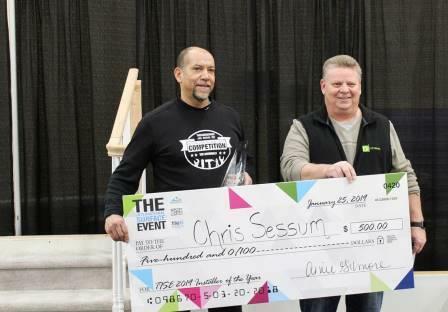 Out of the three, however, there could only be one winner within the Carpet competitors, and the Carpet Judges – Tom Cartmell of Mr. David’s Flooring and CFI’s very own, Jim Walker were proud to announce Chris Sessum of ECS Floor Covering as one of the winners for the 2019 TISE Installation Competition! “For this competition to be put together in such a short time frame, it really was very successful. We had a lot of very positive comments from the crowd observing the competition. As well many asking how they could sign their installers up for it in the future. I feel confident that with the press that was there throughout the competition and the talk about it throughout the show this will grow to be bigger and better than it was in the nineties and early 2000s. I look forward to watching it for many years. It is a very positive event in a time that we need exposure for the trade and craft of Professional Floor Covering,” Cartmell of Mr. David’s Flooring. The Hardwood competitors included: Brandon Mills of BM Flooring out of Norwood, Massachusetts, Brett Bell of RW Flooring out of Foristell, Missouri and Matus Mazurek of MMM Designs out of Sarasota, Florida. 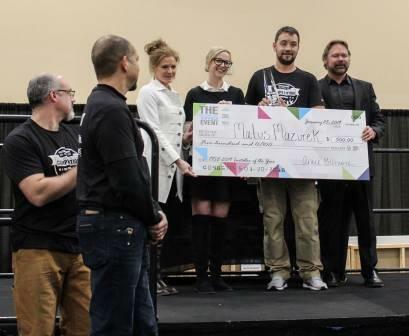 The winner of the Hardwood category of the completion was none other than Matus Mazurek of MMM Designs whom shocked judges Dave Garden of Installation Services, LLC and Paul Pleshek of NAFCT, with his ability to maneuver through his work order under the given circumstances. “This was a fantastic experience for the participants. The contestants spent the week showcasing their craft while working in a fish bowl for hundreds of onlookers. They handled themselves very well, despite the curveballs that were thrown at them,” Garden of Installation Services explains. Last but certainly not least was our Ceramic Tile competitors: Ken Ballin of Skyro Floors out of West Creek, New Jersey and Allen Lewis of Eagle Interiors out of Phenix City, Alabama. The third contestant in the Ceramic Tile category – Heath Meteye of H.J Martin Construction unfortunately was not able to make the show due to unforeseen circumstances. 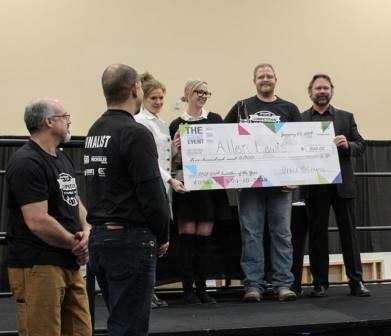 Between the two, Allen Lewis of Eagle Interiors was crowned the winner of the Ceramic Tile category by the judges – Randy Fleming of NTCA and Roy Lewis of Eagle Floor Covering Supplies. Through it all, it would not have been able to happen if it weren’t for our dedicated sponsors and contributors who made sure that the competitors, in all categories, had all the tools and supplies needed to get the job done. Thank you to Personna, Traxx, IQ Powertools, HB Fuller, MD Pro, Tramex, Nourison, Leggett & Platt, CTEF, NTCA, Crain, Mohawk, DalTile and all the volunteers that helped make this event a tremendous success! Installers, get ready to submit your jobs to be a part of The TISE Installation Competition of 2020! There is talent out there and this is the perfect opportunity for you to be noticed.